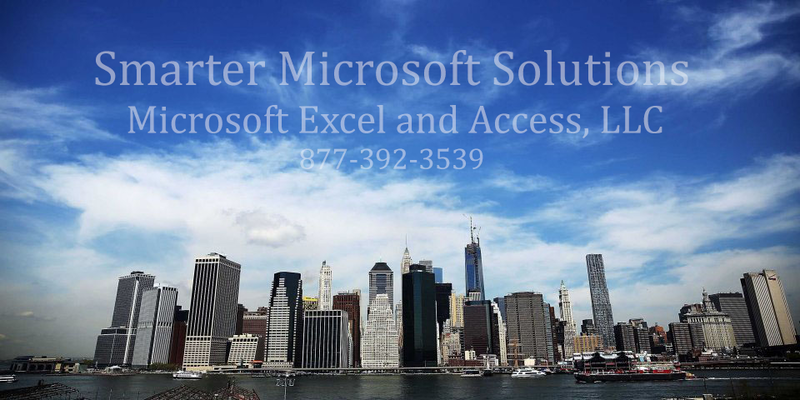 Since 1994 the Microsoft Excel and Access experts have worked both locally and remotely with our clients that call New York home. Being the leading local Excel and Access consultancy in New York has allowed us to go onsite to meet with our local clients, such as the NYPD and Ralph Lauren. Our New York office is right in the heart of Manhattan’s Financial District. You can reach our Lower Manhattan office by dialing 646-205-3261. Our staff of Microsoft experts use their Microsoft mastery to help organizations work smarter, not harder. In total, our staff of professional consultants, programmers and trainers boast over a century of experience, completing more than a thousand successfully completed projects, and well above 10,000 hours of programming time. We often aid major international corporations in optimizing their operations, so it simply makes sense for Excel Consultant to have offices in New York City, a global center of commerce, culture, finance, and business. We are proud to have worked with various clients in this area. Our New York City location makes it easy for our Excel experts to collaborate with executives in many industries. To learn more about our services or schedule a consultation for your New York area-based business, contact Excel Consultant today. Here is a list of the Microsoft applications our New York team of experts can assist you with. Most of the megalopolis’ companies, agencies, institutions, and organizations likely rely on software to function. With the power of Microsoft programs and our extensive expertise, the Excel Consultant team is equipped to help all types of clients, from small businesses to governmental agencies to multinational corporations. We also understand (and even thrive on) the fast-paced nature of our New York clientele. Our team knows how to efficiently deliver effective solutions. PepsiCo. This household name in the food and beverage industry is best known for its namesake cola, Pepsi, but the corporation also makes and distributes Mountain Dew, Lay’s chips, Cheetos, Gatorade, Aquafina water, Lipton teas, and more. As one of the giants in its field, PepsiCo produces over $66 billion in annual revenues. Its operations can’t be contained within the crowded boundaries of New York City-PepsiCo’s headquarters are in the suburb of Purchase, NY. Merrill Lynch. This wealth management firm has helped businesses and individuals make the most of their resources for over a hundred years. Headquartered in New York City, Merrill Lynch generates approximately $14 billion in revenue and employs over 15,000 employees. Morgan Stanley. This financial services firm has offices around the nation, but its primary hub is in New York City. Founded more than 80 years ago, Morgan Stanley provides sales, trading, brokerage, investing, wealth management, banking, and other services to its varied clientele. The Excel Consultant team assisted one of Morgan Stanley’s Vice President Financial Advisers, James Ritchie, in streamlining and automating his spreadsheet system. To learn more about this project, check out our case study. Ralph Lauren. Designer and entrepreneur Ralph Lauren created his namesake fashion and lifestyle brand nearly 50 years ago in 1967. Today, the Polo Ralph Lauren Corporation generates annual revenue of over $7.4 million, employs over 23,000 workers, and helps shape modern American trends. Verizon Wireless. As the top wireless telecommunications provider in America, this company relies on digital software to function. Verizon Wireless is headquartered in the New York City suburb of Basking Ridge, New Jersey. Founded just 15 years ago, Verizon Wireless now serves more than 135 million subscribers. IBM. Technically called the “International Business Machines Corporation,” IBM is undoubtedly a leader in the technology industry. The company manufactures, distributes, and consults on a variety of hardware and software products. IBM’s headquarters are in the New York City suburb of Endicott, NY. The New York Police Department. This municipal force is the largest in the nation and one of the oldest. Founded in 1845, the New York Police Department, or NYPD, employs tens of thousands of officers to maintain peace, order, and security in this urban center. In addition to usual law enforcement procedures, the NYPD specializes in emergency services, criminal intelligence, counter-terrorism, and more. Some of our best team members make their homes in the New York area, ready to serve clients in this region. Our Senior Access Developer, Helen Feddema, is also based in this area. A Microsoft aficionado in Access, Outlook, Word and Excel since the early days with a passion for sharing her knowledge, Helen has authored numerous books and hundreds of articles on using these programs. Joseph Carrier in Washington, D.C., Chief Technology Officer and Project Manager, routinely engages our New York clients both remotely and on site. He is available to devise your next software solution. His expertise in Excel consulting and programming of financial models and in depth analysis makes him an excellent fit for the commercial capital of New York City. Whether you need to fix a glitch, code a new program, perform complex analyses, or simply learn to use your software better, Excel Consultant can help. Contact us today to learn more about our services or schedule a free consultation, for your New York-based business.